Recharge your Yeti Lithium Power Packs up to 5 times faster with the 25A AC Power Supply! Only for use with Yeti Lithium 1000, Yeti Lithium 1400 and Yeti Lithium 3000. 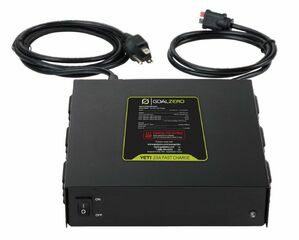 • Now you can Recharge your Goal Zero Yeti Solar Generators very quickly at 25 Amps per hour! Only for use with the following Powerpacks: Goal Zero Yeti 1000 Lithium. Goal Zero Yeti 1400 Lithium. Goal Zero Yeti 3000 Lithium.